The year 2017 witnessed the revocation of 155 citizenships of Bahrainis, due to politically-motivated cases. On average, that would be 13 citizenship revocations every month. The year 2016 witnessed the revocation of 90 citizenships, while 2015 embraced the revocation of 208 citizenships, 21 citizenships in 2014 and 31 citizenships in 2012. This sums up 506 Bahrainis having their citizenship revoked, as part of the 2011 events repercussions. The Bahraini judiciary was the authorities’ tool to punish the Bahraini opposition, through trying them under the "terrorism law”, and revoking their citizenships. Citizenship revocations became like a piece of cake, that comes on the side of most issued verdicts against political convicts. To wrap up the accusations included in the politically-motivated cases against the political defendants, we’d list: joining a terrorist group, conspiring with Iran, training on using weapons and bombs in Iran and Iraq, possessing weapons, ammunition, funding terrorist operations, in addition to attempting to murder police or deliberately killing them. This resulted in very harsh verdicts like citizenship revocations, death penalties, and life sentences. Some of the cases that saw the citizenship revocation of many political defendants were a case linked to establishing and joining the so-called "Al-Mukhtar” Brigades, another linked to establishing and joining the so-called "Al-Ashtar” Brigades, and the February 14 coalition case. In April alone, the court ruled the revocation of citizenships of 36 defendants, with varying sentences that include life sentences. The verdicts were issued after accusations of establishing and joining "a terrorist group, receiving support, funding them, importing and possessing weapons”. 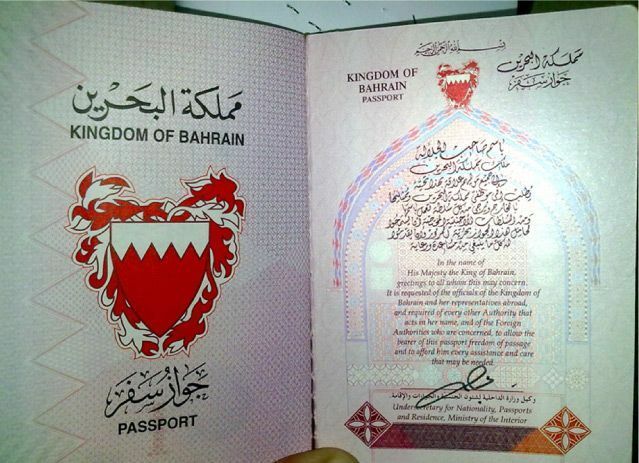 The citizenships of 2 other Bahrainis were revoked in another case. In June, a Bahraini court revoked the citizenships of two defendants linked to the "Ekker” blast, which claimed the life of Bahraini citizen Fakhriya Muslim. The court sentenced one of the aforementioned defendants to death. In the same month, the wife of opposition cleric Abdullah Al-Daqqaq was informed that her citizenship was revoked, and she was then deported from the country. Sheikh Al-Daqqaq’s citizenship was revoked the same year as well by virtue of a judicial verdict. In September, the 6th High Criminal Court of Appeals upheld the sentence to revoke the citizenships of 3 Bahrainis, accusing them of joining the "(Al-Wafaa) Movement”, and recruiting members to join it. In the same month, a Bahraini court ruled the revocation of 14 citizenships, whose owners were accused by the authorities of forming a cell named "Al-Basta Group”, to conspire with Iran, the Iranian Revolutionary Corps, and Hezbollah. In November, the High Court of Appeals upheld the citizenship revocation verdict issued against 36 defendants, whom the authorities accused of forming a "terrorist group” to organize unauthorized protests, and plant fake bombs. The Bahraini regime sought to have 2017 sparkle with exceptional events, and thus it was keen to intensify its harshest judicial verdicts. The Supreme Military Court issued on December 15, a decision sentencing 6 Bahrainis to death. The Ministry of Interior said in its statement that the defendants formed a terrorist cell, and attempted to assassinate the Chief Commander of the Bahrain Defense Forces. The citizenships of the defendants were ruled to be revoked, along with those of 7 others. 2 days after this incident, on December 27, the Fourth High Criminal Court revoked the citizenship of 11 Bahrainis, in a case linked to an explosives storage, which the Ministry of Interior said it revealed in Nuwaidrat.